For scientists attempting to understand how the building blocks of RNA originated on Earth, guanine -- the G in the four-letter code of life -- has proven to be a particular challenge. While the other three bases of RNA -- adenine (A), cytosine (C) and uracil (U) -- could be created by heating a simple precursor compound in the presence of certain naturally occurring catalysts, guanine had not been observed as a product of the same reactions. By adding ultraviolet light to a model prebiotic reaction, researchers from the Georgia Institute of Technology and the University of Roma, "La Sapienza", have discovered a route by which the missing guanine could have been formed. They also found that the RNA bases may have been easier to form than previously thought -- suggesting that starting life on Earth might not have been so difficult after all. 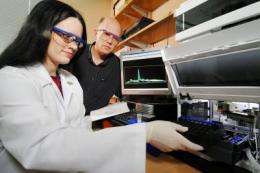 The findings are reported June 14, 2010 in the journal ChemBioChem. This collaborative work is supported by the National Science Foundation (NSF), the National Aeronautics and Space Administration, and the European Space Agency. The NSF funding is provided through the Center for Chemical Evolution at Georgia Tech. Understanding how life emerged is one of the greatest scientific challenges. There is considerable evidence that the evolution of life passed through an early stage in which RNA played a more central role, before DNA and protein enzymes appeared. Recent efforts to understand the prebiotic formation of the building blocks of RNA have focused on the chemical formamide (H2NCOH) as a potential starting material to create the RNA bases because it contains the four required elements -- carbon, hydrogen, oxygen and nitrogen -- and because of its stability, reactivity and low volatility compared to water. Previous reports have shown that these nucleic acid components -- with the exception of guanine -- can be synthesized by heating formamide to 160 degrees Celsius in the presence of mineral catalysts. In their ChemBioChem paper, the researchers show for the first time that guanine can be produced by subjecting a solution of formamide to ultraviolet radiation during heating. The trace gaunine yield was greatly enhanced when minerals and photons were used together. In addition, production of adenine and a related molecule called hypoxanthine increased when ultraviolet light was added to the heating process -- a 15-fold increase was seen in adenine yield. "These results potentially relax some of the requirements and reactions necessary to get life started, because formamide molecules would not have had to be in contact with a particular type of rock when heated on the prebiotic Earth, if the formamide was exposed to direct sunlight during heating," said Nicholas Hud, a professor in the Georgia Tech School of Chemistry and Biochemistry. The study demonstrated that guanine, adenine and hypoxanthine can be produced at lower temperatures than previously reported, even in the absence of minerals, as long as photons are added. "For these experiments we built a very simple reaction chamber with an inexpensive 254-nanometer photon source to simulate conditions that could have been present on early Earth," explained Thomas Orlando, also a professor in Georgia Tech's School of Chemistry and Biochemistry. "We didn't need extremely sophisticated experimental systems or expensive lasers; however, we did use sophisticated mass spectrometers to analyze the resulting complex chemical mixtures." The Hud and Orlando laboratories conducted experiments by heating formamide to 130 degrees Celsius -- 30 degrees cooler than previous experiments -- and shining ultraviolet light onto it. "Our work has allowed us to consider a different type of 'primordial soup' than what has previously been considered possible starting conditions for life," said Orlando. "Our model prebiotic reaction is attractive because most aspects of the process were likely to occur on the early Earth and it reduces chemical constraints." The authors suggest that aqueous pools containing small amounts of formamide may have existed on the early Earth. During hot and dry periods, water evaporation could have given rise to concentrated solutions of formamide and exposed mineral surfaces coated with formamide. By conducting additional experiments at 100 degrees Celsius with solutions of formamide and water, the researchers confirmed that this "drying pool" model could give rise to solutions of formamide capable of producing the compounds found in their earlier experiments. "While there is still a lot of chemistry required for us to better understand the formation of biological molecules needed for life, these one-pot reactions that occur due to the synergy of thermal and photochemical processes tell us that the chemical and environmental requirements to produce life are probably less restrictive than we once thought," added Hud. Having the building blocks in place is one thing, kick-starting the life process is another thing completely. We KNOW from all written history and our own experience that nothing that dies comes back to life again. And yet all the building blocks for life is present when that once living thing dies. So just why doesn't something spontaneously come back from the dead state? It's NEVER happened before. So why do they expect some miracle to happen to kickstart dead molecules into life? Oh, by the way, what exactly is a prebiotic precursor mixture and how do they know that it existed in the form that they've got under the exact conditions to form the building blocks? Did someone go back in time to find those conditions out? And yet all the building blocks for life is present when that once living thing dies. So just why doesn't something spontaneously come back from the dead state? In simple organisms this happens rather often. I'm sure you've dealt with mould spores in the past. Just one of many examples. So why do they expect some miracle to happen to kickstart dead molecules into life? Ha! your beliefs slowly come crashing down Kev. This one is for Io! May you leave that poor little moon alone.